Hopefully, your resolutions are off to a stronger start–way to go if you’ve already dropped 20 pounds and finished the Old Testament! Either way, we’re here to help you keep one resolution we know you strongly believe in: spending more time on what’s important in ministry. Maybe, for you, this means building up your volunteer leaders, partnering with parents, or making your budget dollars go further…well, the DYM Membership (a.k.a. the “Best Deal in the History of Youth Ministry”) can help you do all of this AND more! The DYM Membership. Focus on the things only you can do and let us help you do the rest. $20 in store credit—that’s right, you get your money back EVERY MONTH—to use on anything you want…because you know exactly what you need. 1 brand new high-quality, silly, relevant, or creative slide- or video-based game. 1 brand new video (from encouraging to ridiculous) available exclusively to DYM Members. Unrestricted access to a game- building and presentation tool with a growing digital library of engaging, reusable and customizable games. New curriculum designed to challenge student leaders to change the way they think about serving. A 20-minute audio interview with an experienced leader, hosted by Josh Griffin. A 10-minute video training from a veteran youth worker (Doug Fields, Josh Griffin, and others) to help develop your leaders. Unrestricted access to the only newsletter builder built specifically for ministry. 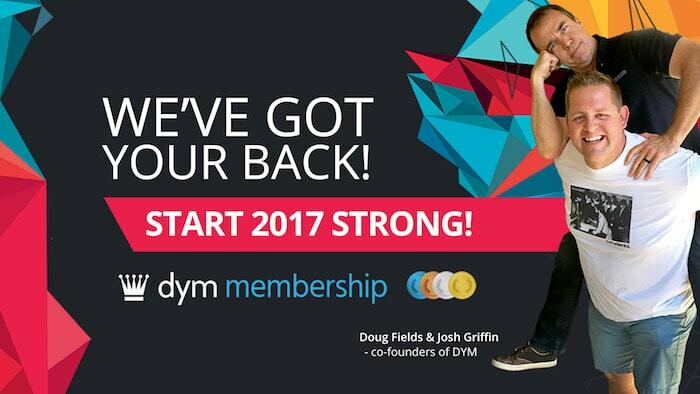 Access to a free, members-only group texting plan on DYM’s group text tool. Anything from incredible curriculum by partnering ministries to major discounts on conferences—it’s always different and always awesome. 1st Prize – A FREE Registration to DYM100. You’ll be the first to be officially registered for this exclusive event. No need to panic about getting one of only 100 spots available—yours will be guaranteed! What is DYM100, you ask? Learn more about the event HERE. It’s definitely one youth ministry event you won’t want to miss! 2nd Prize – $250 in DYM Store Credit. Outfit your ministry with the perfect resources to start the New Year. 3rd Prize – Something stolen from Doug’s office. You never know what treasures are hidden away in Doug’s home-away-from-Del Taco, but Josh will make sure he smuggles out something great just for you!